The diversity of members: bloggers, academics, civil servants, people of faith, policy officers, campaigners, wonks, lobbyists, journalists, geeks, you. Members can use the internet to check facts or provide references during debate. Motions can be introduced on the spot. 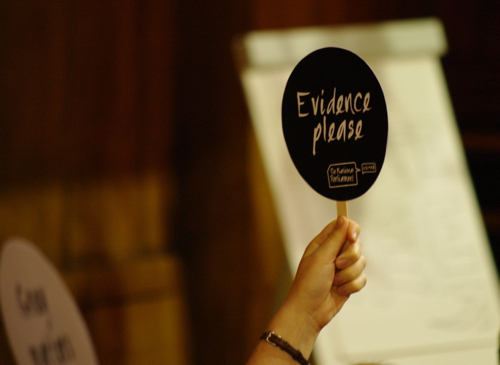 Members can raise their “Evidence please” placards to force another member to find the evidence that supports their statements. After each sitting the house produces a brief document that summarises the debate and draws parallels or divergence from related debates in Westminster.